Barbados Beach home Guest-house in Barbados Saint Lawrence Gap - Worthing, South Coast. There is sea view from the veranda of the property. Just enjoy the ocean view, listen of the rolling of the sea or swim with the turtles in Barbados at the left side of the bay at the beach right in front this house. There is a tropical garden available for the guests. This accommodation is value for money. The guest-house is truly still a hidden Gem at a reasonable price in Barbados. Sometimes the calendar shows no availability but I have space. Just try different dates and write us. Please note that I don't have always have time to update the calendar. Minimum stay depends on season, openings and availability. The company only allowed setting one minimum stay per season. Please inquire. This German managed wooden/stone guesthouse and apartments is built in the past colonial style. Additional the property is regular renovated to meet today’s standard of accommodations. The studio apartments are hidden from the main tourist area but still just a 5 minutes’ walk to all the amenities of the main tourist strip, the famous Saint Lawrence Gap in Barbados. The guesthouse is still far enough away not to be disturbed by the music of the night entertainments of the Gap. The studio is matching decorated and have own in-suite bath. Sat / Flat TV and telephone. A dining table is on the veranda. The studio has either 2 single beds or 1 king size bed. Please let us know what kind of bed type you require. Please note at this rate here you book and pay here just for fan use. Air-conditioning can be obtained at arrival at cost if required. Most of our guests doesn't want AC but the units are in the studios. We do have Air-conditioning available at cost of 10 US per night. The guest-house room has burglary proved wrought iron bars, mosquito screens (we don't have many mosquitoes) on the windows. Additionally there is Sat TV, Safe box and telephone available in the studio. Free Wi-Fi fast fiber optic wireless cable Internet (optimal for movie streaming) on the property. Please bring your own devise. The telephone is available for guest and local calls are free of charge. Smoking is only allowed on the veranda or in the garden to avoid inconvenience for non-smokers. The property is opposite of one of the nicest beaches in Barbados and there is a view from the veranda to the opposite beach / ocean. It is approx. 15 meters/yards to the sea and the lovely Sandy Beach (view from the veranda of the house see picture). There are beach bars, chair and umbrella rentals as well as some kind of water-sports available at cost on the beach. More beaches just 5-10 minutes walk away..
Fresh sheets every 5 days (more on request), towels and room service are provided at least twice per week or on request. The center of the famous Saint Lawrence Gap (main south coast tourist area) is about 5 minutes walk away. The location St. Lawrence Gap is a preferable area for visitors as there are many hotels, restaurants, beach bars, bar, discos, mini marts, shops, banks and the night life of Barbados is in 5 minutes walking distance. Golf, Squash, Tennis, Fitness center and most water sports like diving and Jet Skis are easily accessible. The bus stop is about 50 yards/meter away. There are buses, mini-buses and route-taxis going to the capital Bridgetown (approx. every 15 min) and to other parts of the island until midnight. The bus fare is $2.00 BDS. Barbados cheap apartments for rent. 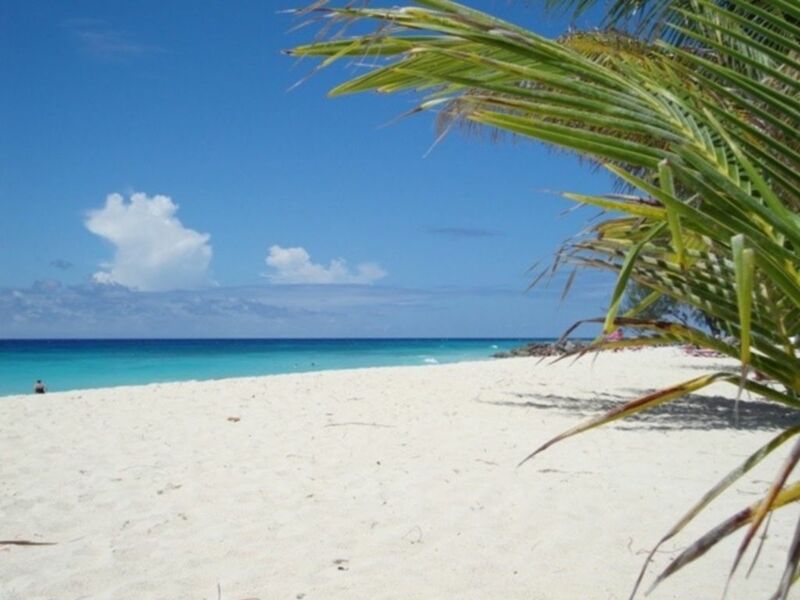 Barbados Vacation-rentals by private owner. Self-catering budget accommodations in Barbados. Value for money for vacation homes, rooms and apartments Best location opposite a most beautiful beach in Barbados. An ocean view property which everybody can afford. Close to everything what you might like for a good and relaxing vacation. Only a stroll of 15 meter / yards away from the white Sandy Beach lying on a turquoise lagoon protected by a small coral reef. Sea / beach view sea picture. There are other beaches in 5 minute walking distance as well The center of St. Lawrence Gap in Barbados which is the main south coast tourist area is about 5 minutes’ walk. In Saint Lawrence Gap you will find hotels, restaurants, delis, bars, beach bars, clubs, discos, banks, super-markets and all kind of shops. Everything you might want for your vacation is just walking distance or a short bus ride away. Best beaches in Barbados where you can swim at any time of the year. Barbados has many nice beaches but in winter season you can't swim without dangerous in many of the other locations. Beach & Ocean view from the veranda of the property. Enjoy the view and rolling of the ocean when relaxing in front on the veranda to one of the nicest beaches in Barbados. Enjoy the sea breeze and the rolling of the sea when relaxing on the veranda. Every 5 nights or at request. Not available but guests can get their cloth dried at cost in our laudry. Free parking at the house or on the car park next door. Fiber optic cable wi-fi which can be used for video screening. We have a veranda no balconies. Most water sports equipment can be rented at cost on the beaches. Can be rented at cost on the beaches. Side view from the veranda of the house to the opposite beach. Table and chairs for dining or relaxing. Located opposite beautiful Sandy Beach with sea / beach view from the patio of the house. Beach Bars, many different beaches, night life, supermarket, bank, launder mat, hotels, restaurants, fast food outlets, shops and anything you might want in 5 minutes walking distance. The center of St.Lawrence Gap (main south coast tourist area) is about 5 walking minutes away. In St. Lawrence Gap you will find hotels, restaurants, bars, clubs, discos, banks and different shops. Snorkel , Diving, Windsurfing, surfing and any water sports are close by.